Drones may fly high but Kevin Kelly, president/COO, Stampede, has a firm grip on their presence in the AV industry. New facets of commercial AV can begin as an idea in search of commercial validation, driven by a core group of companies evangelizing the benefits of new technology. “It's the visionaries who open the eyes of the mainstream systems integrators. This has always been the case,” said Kelly. Although systems integrators are not getting a lot of requests for drones at the moment, as education and government accounts start including them in their quote requests, integrators will incorporate them as well, according to Tim McPherson, sales manager, VSA. In addition to the education market, McPherson currently works with drone customers ranging from mom and pop videographers to the New York Mets, and houses of worship to communications firms and many amateur video artists. Most clients are interested in how drones can help them stand out from the competition. Recently, VSA had a top-of-the-line drone project for a parks department that wanted to gain insight as to the health of its various parks without having its employees walk around the parks for hours, or even days. Using drones, the staff was able to see what upgrades and additions were needed in a matter of minutes or hours, and the collected data was readily available. So, what's next from manufacturers in drone technology? 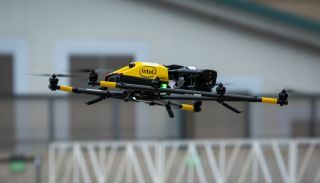 Intel, for one, is taking drone technology to the next level and generation of products and solutions. Intel’s Falcon 8+ drone captures detailed aerial data for 3D reconstruction, and can be programmed to fly an automated path. The DJI Matrice 210 features an IP43 rating which means the drone can maintain stable flight in light rain conditions. Typically, McPherson is on the phone with sixty or more clients per day, many of whom are communications professionals or videographers. “I bring up the advantages and disadvantages of drones in about 25 percent of these conversations.